Let's cut to the chase and be totally honest here. Paris is not the easiest when it comes to travelling with a sensitive tummy compared to other countries - but I have to say that awareness of special dietary requirements has most certainly improved. The last time I went about six years ago - everytime I presented my travel card I was invariably met with a "Mon Dieu!" (translation "My God!") - and whispers of "Poor girl" in French - however people still tried their best and I found the French to be very accommodating once I apologised and tried my best to poorly communicate with them in their language. The biggest problem though was cross contamination (hard to explain if you don't know the language) and I ultimately found myself very sick after one meal - not the best result but I was still grateful that the effort was made. Fast forward six years later and upon arriving in Paris - I had a good deal of caution in my mind and imagined a visual feast but nothing more. But I was surprised & delighted by the changes that have occurred in my absence. In my previous post I mentioned how I always bring my rice cooker to ensure I get a hot meal when I stay in a hotel. This is what I did this time - however - the best way to experience Paris and its beautiful food is to rent an apartment with a kitchen - and buy your ingredients and cook your own feast. I loved doing this the other times I've been. Paris offers up a bevy of incredible produce - exploring markets or buying from the local supermarket is one perfect way to experience the people and its culture. What could be better? Breathe in the atmosphere, smell a tomato bursting with juice, roll orb-like aubergines (or eggplants) around in your hands and soak in all of the amazing produce. Once you take your procurements home you will be well on your way to your own delicious feast! 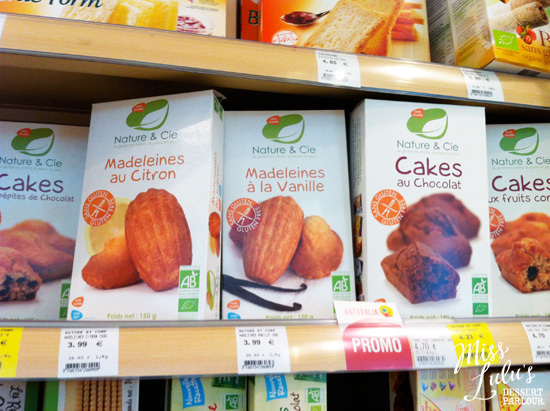 One place that made my heart leap for joy was Naturalia - one of Paris' major health food stores (others include Biocoop & La Vie Claire). I found myself scanning the gluten free section like a crazed, overly excited woman! There were cakes, biscuits, crackers and gluten free bread options. Everything I bought tasted brilliant and the majority of what was on offer was gluten AND dairy free. These boxes full of promise did not disappoint. They may not have been fresh from the oven but for a place where I didn't expect anything... they were a godsend and made my trip to Paris so much more pleasurable. As I mentioned in my previous post - my hotel organised gluten free bread especially for me. It always helps in every situation where you hope to eat to give as much advance notice as possible. This was absolutely the case with me and I was really touched that the hotel went out of their way to accommodate me. As well as this - I was able to enjoy some beautiful dinners and I thankfully didn't have any repercussions. 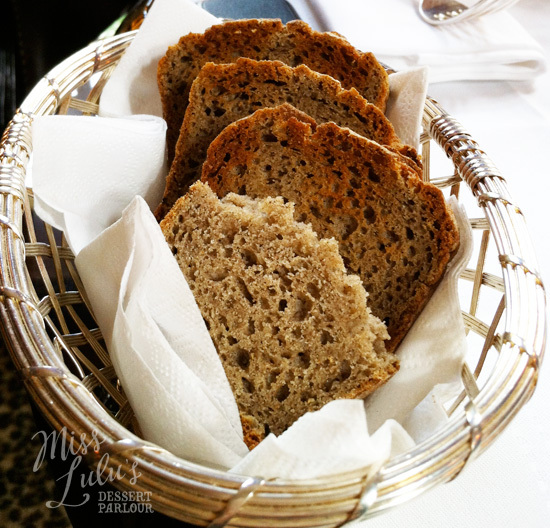 There is a great website that lists all of the hotels in Paris that can accommodate the gluten free diet which was a great help. On my last day I discovered that certain foie gras and duck confit are gluten and dairy free. I didn't have any as I was about to board the plane - but you can purchase these items from places such as Hédiard. Going to places like this are an experience in itself and the ingredients are clearly listed in English as well for peace of mind. You can also enjoy a glacé, sorbet or even paté de fruits (or fruit jellies) which are often available too in various places such as Pierre Hermé and Hédiard. There are some incredibly inventive flavours and Hédiard had a gorgeous display of fruit jellies (with flavours such a lychee & kiwi fruit). But it always helps if there is an ingredients list to make sure. Just Gluten Free? You must continue reading! If you don't have don't have other issues like dairy and only need to eat gluten free - you are in for some exciting information! I have two words for you - Helmut Newcake - the very first gluten free bakery in Paris. I didn't visit there as I was advised that everything there has butter in it and I just couldn't bare the thought of being so close and yet so far - however the owner said she has been testing some products using rice milk and will hopefully be able to offer something dairy free as well. There is a delicious post by the great David Lebovitz about Helmut Newcake that is well worth reading. He also has a post about eating gluten free in Paris as well. But everything I've read about this place is that it tastes even better than the real thing! Generally steak frites (steak and fries) is also safe for coeliacs. Yum Yum! If you're concerned about cross contamination - there is a beautiful place called Le Relais de L'Entrecote that prepares Steak Frites and nothing else (there are desserts as well). My hotel checked for me and said that they would be able to accommodate me (but I'd already stuffed too many madeleines in and was too full - one regret from my trip to Paris was missing out on this meal)... However I still went there with Mr Lulu - and it is obviously good as the locals were lining up as well and Mr Lulu was extremely pleased with the meal and said the steak was cooked perfectly. Traditional crepes & gallettes can be gluten free and are often made with buckwheat - but you have to make sure as there are different types that are also made with wheat flour, commonly the ones for dessert. An important point is I'm unsure of cross contamination as many places seem to make both - so I'd suggest calling ahead and getting someone like your concierge to ask whether both are prepared on the same hot pans. I have to admit I've seen them being prepared on the same hot pans in some places so this is an important one to investigate before you dive in. Lastly - macaron fiends will be in heaven - Paris is the master of the macaron. Oh to be only gluten free! Tea salons such as Ladurée, Pierre Hermé and Lenotre are right at your fingertips with stores dotted all over the place. The colours and interesting flavour combinations were truly inspiring to behold. If only I could have tried them! So only one post for Paris - sorry guys - but here are some other places that I visited that I found really helpful. Next up - New York (and lots of posts - there are so many delicious places I need to share with you all)!!! It must be so hard to be gluten and dairy intolerant :( We are coeliac and I thought that was hard enough! I've heard of "Helmut Newcake" and I honestly can't wait to go to Paris just to try this place out! And macarons.... can only imagine how good they would be!